FORT SILL, Okla., Jan. 24, 2019 -- In a time where nearly every government agency is experiencing cutbacks and reductions, Reynolds Army Health Clinic (RAHC) is proud to announce the return of urgent care services. "Our Fires community needed our post urgent care services," said Col. Enrique Ortiz Jr., RAHC commander. "Fires growth and the need for reducing lost training time and lost leader time due to unnecessary trips to off-post emergency rooms justified the decision to open our urgent care clinic (UCC). Our UCC will enable Fires readiness and deliver on a commitment to this great community." The Urgent Care Clinic opened Jan. 7. In October 2016, Reynolds transitioned from a hospital to a clinic and with that transitioned its emergency room to an acute care clinic. Then in June 2017, Reynolds had to close its acute care clinic due to low volume, high cost, and insufficient readiness value. "Anyone familiar with the Army can attest how rare and extremely hard it is to regain a service that was cut," Ortiz said. "This is a testament to the employees we have at Reynolds and the support we have received from the Fires Center of Excellence, to regain some of the services that were transitioned to the local network." With the opening of the UCC, the current Extended Hours Clinic closed, moving those services to the UCC. "We want to emphasize that Reynolds will still not provide emergency medical care on Fort Sill," said Col. Douglas Maurer, RAHC deputy commander for clinical services. "It is also important that all our beneficiaries understand that our uniformed service members are the first priority at the new UCC," said Maurer. 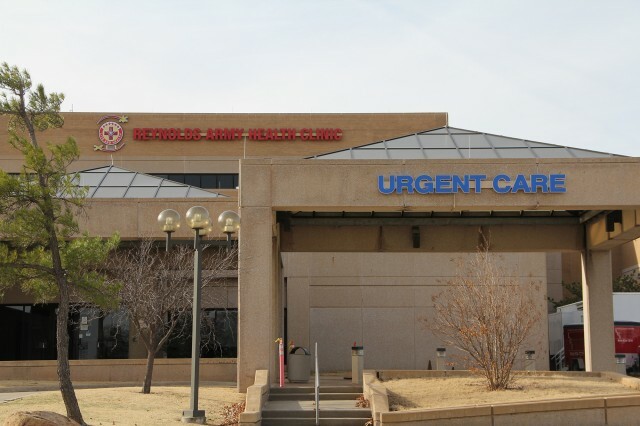 "The Urgent Care Clinic capabilities will be comparable to the care you will receive at any urgent care clinic in Lawton. The UCC is open Mondays through Fridays, 4-11 p.m., and Saturdays and Sundays, 7 a.m. to 7 p.m.
RAHC may increase hours of operation. Beneficiaries who wish to be seen before 4 p.m. can make an appointment with their primary care providers using the RAHC appointment line at 833-286-3732 or by using TRICARE Online at www.tricareonline.com.